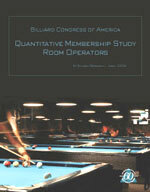 The Billiard Congress of America (BCA) conducted an annual membership study in January of 2008. The main goals of this study were to understand the overall state of the BCA, in addition to providing retailers and room operators with specific information about their respective parts of the industry. Results of the retailer and room operator study are now available. This in-depth analysis on retail and pool room business also provides a snapshot of pool room and billiard retail demographics. Current BCA members can download the reports, free of charge, at the links listed below. BCA members will be asked to provide a username and password in order to access the reports. The reports are also available in electronic (pdf) format to non-BCA members for a fee of $250 (per report). Please allow seven to 5 business days for order processing. Interested in joining the BCA? Learn more about BCA member types and benefits today! If you encounter any issues when trying to access the reports or download the order form, please contact Shane Tyree, BCA membership manager, at 303.243.5070 or via e-mail at shane@bca-pool.com. During the course of conducting interviews for the 2008 BCA Quantitative Membership Study, room operators were asked a series of questions that were unique to their specific businesses. The gathered information provides insight into how other room operators run their businesses, the priorities they place on various issues and their thoughts on specific issues facing their businesses. This report is designed only for room operators. A total of 300 interviews were completed during the course of the study. Of these 300 interviews, 61 room operators were interviewed. The final report is broken into several parts. The first part includes various baseline indicators used to assess key similarities and differences between room operators. The second section examines the financial implications of owning a billiard hall. The third section examines more general challenges room operators are facing and the fourth section examines the role of the Internet in owning a billiard hall. The final section is a subsequent overview pertaining to some of the main findings throughout the room operator report. BCA Members – Download the 2008 BCA Quantitative Membership Study: Room Operators (PDF format). Non-BCA Members – contact Shane Tyree at shane@bca-pool.com. During the course of conducting interviews for the 2008 BCA Quantitative Membership Study, retailers were asked a series of questions that were unique to their specific businesses. For the purposes of this report, retailers are defined as owning a brick-and-motor store or owning a physical storefront establishment. Hence, the responses provided to these questions do not include any Internet-only retailers. The gathered information provides insight into how other retailers run their businesses, the priorities they place on various issues and their thoughts on specific issues facing their businesses. This report is designed only for retailers. A total of 300 interviews were completed during the course of the study. Of these 300 interviews, 153 retailers were interviewed. The final report is broken into several parts. The first part includes various baseline indicators used to assess key similarities and differences between retailers. The second section examines the financial implications of owning a retail establishment. The third section examines more general challenges retailers are facing and the fourth section examines the role of the Internet in owning a retail establishment. The final section is a subsequent overview pertaining to some of the main findings throughout the retailer report. 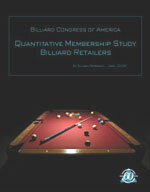 BCA Members – Download the 2008 BCA Quantitative Membership Study: Billiard Retailers (PDF format).